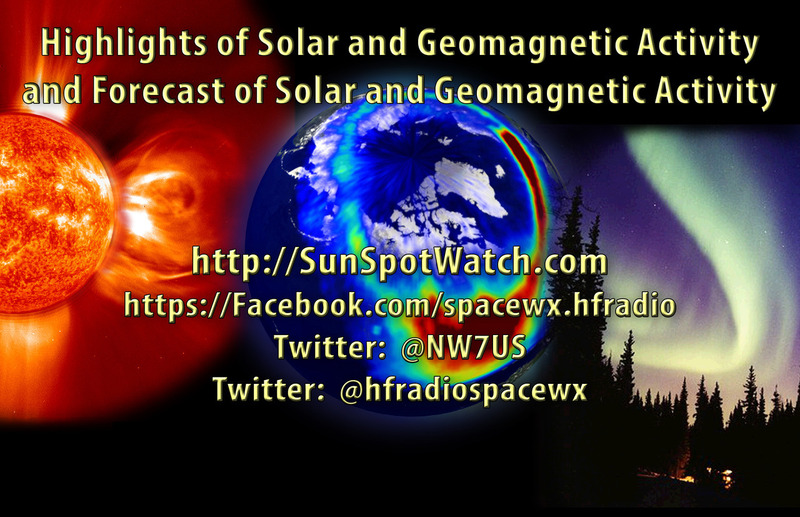 Here is this week’s space weather and geophysical report, issued 2019 Apr 01 0125 UTC. Solar activity was very low throughout the period. Region 2736 (N08, L=284, class/area-Eki/420 on 22 Mar) produced low level B-class flare activity after its rotation around the west limb. Region 2737 (N12, L=059, class/area-Bxo/10 on 31 Mar) emerged on the disk but was inactive. No Earth-directed coronal mass ejections (CME) were observed. The greater than 2 MeV electron flux at geosynchronous orbit was at moderate levels throughout the reporting period. Geomagnetic field activity reached active levels on 31 March and unsettled levels on 26-28 March due to influence from multiple, negative polarity coronal hole high-speed streams (CH HSS). Quiet conditions were observed on 25, 29-30 March. Solar activity is expected to be very low on 01-05 and 20-27 April. Low levels are expected between 06-19 April due to the return of Region 2736. The greater than 2 MeV electron flux at geosynchronous orbit is expected to reach high levels on 01-07 April with normal to moderate levels expected throughout the remainder of the outlook period. Geomagnetic field activity is expected to reach active levels on 12 April due to influence from a recurrent, negative-polarity CH HSS. Quiet to unsettled levels are expected throughout the remainder of the outlook period. I am working on launching a YouTube channel overhaul, that includes series of videos about space weather, radio signal propagation, and more. Additionally, I am working on improving the educational efforts via the email, Facebook, YouTube, Tumblr, and other activities. Tomas Hood, NW7US, is a regular contributor to AmateurRadio.com and writes from Nebraska, USA. Tomas is the Space Weather and Radio Propagation Contributing Editor to 'CQ Amateur Radio Magazine', 'The Spectrum Monitor', and 'RadioUser UK Magazine'. Can someone, in very simple ham language, explain what has so drastically changed, that the radio propagation has gone down so much & we are not seeing a lasting improvement of any kind ? For example what has happened to the peaks we saw in the 1950s,1960s & 1970s ? Has it got something to do with all the space exploration going on or is it basically the sun getting old ?